Chain mail armor was one of the first armors developed in the medieval era. It was used by the Romans in the beginning of 2nd century BC. Rather the medieval knights are remembered for their elaborate armors as for their bravery. A well made chain mail coud spell life and a weak chain mail, its end. 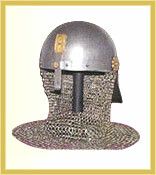 The armor is often called maille, or chain maille. It was the status symbol of the knight. It was the life and style of knights. It evolved as the weapons improved. It consists of a fine mesh of rings. The rings were interlockked with eachother to form a fine mesh. It was worn over a layer of padded fabric or leather. This padding protected from chafing and insulted from extreme heat and cold. It was time consuming to make the armor but not complicated. 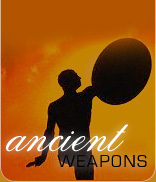 It was the heaviest type of armor that could weigh 45 - 55 pounds. It was worn with a belt to lessen the burden on the shoulder and divide it to the waist. It was a flexible armor that did not hamper the movement . it was easy to get in and out of the armor. It was the most favored type of armor till the 15th century when to ddeal with more sophisticated weapons, the plate armor evolved.